Welcome to wearable art !! You are going to make a quilt that you will be able to wear and show your creativity to all. 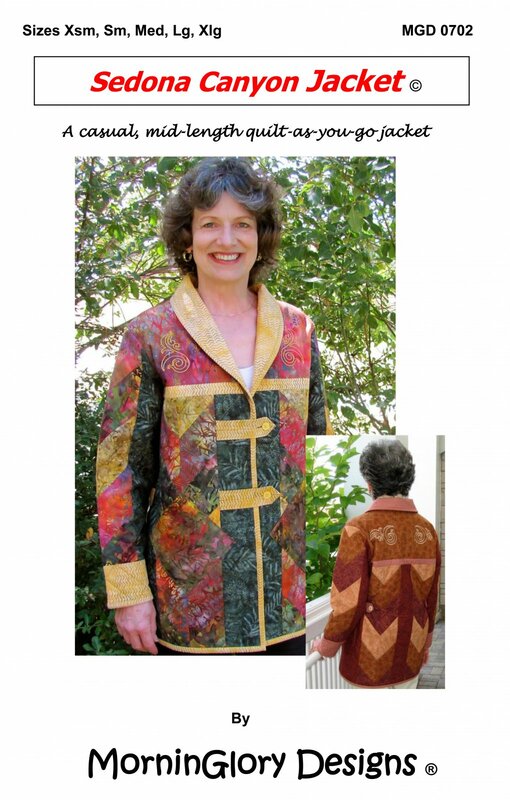 This mid length quilt as you go jacket is sure to be a hit. Vertical strips with chevron design are stylish and slimming. Contrasting cuffs, pockets, tabs, shawl collar and binding accent the jacket and highlight the yokes which are ready for you to unleash your creativity with embellishing designs. Minimum of 4 students is required. At least 4 students must be signed up by February 12 for the class to be held. Instructor Bio: Cindy was raised in the heart of the Appalachian Mountains in Western Maryland, where quilting was a part of everyday life. Her Grandmothers started teaching Cindy to quilt when she was about five years old, when they saw she was trying to make clothes for her doll. Cindy made her first full sized quilt, pieced and quilted by hand, before she turned 10 years old. Her grandmothers started with cottons of the times (1950's) but encouraged Cindy to experiment with the cotton/polyesters that were coming out in the 1960's and to use other fabrics. Cindy was taken to traditional old-fashioned quilting bees at the church's and the homes of her grandmother's friends. Cindy learned to use different color combinations from the bees and started her experimenting with colors and textures, which in turn, led her to experiment with other non-traditional fabrics for quilting. Also, during that time, Cindy?s mother taught her how to construct clothing. While in High School, Cindy was combining the two skills (quilting and clothing) into her own projects. After high school, Cindy served in the US Women's Army Corps, married and raised children and moved around with her military family. Cindy has been teaching quilting since 1974, locally, regionally and internationally. She has won numerous awards as a quilter, including an award from the Japanese National Defense Force of Okinawa for two of her quilts. In 1986, her wall hanging from the Great American Quilt Contest for the Statue of Liberty toured across the US and Canada in a Hoffman challenge show. Her quilts have also been in published works, such as Quilting with Manhole Covers, Treasures Underfoot, and many others. Cindy currently lives in Woodbridge, VA, with her husband, their 18-year-old college granddaughter, and 2 cats.